Beware not to be confused! Within a short period of time we’ll be able to see in the sky something really impressive. It is the Russian Flying Saucer. The news have been spread by the Novosti agency and journalists of the internet publication Space Daily have worked on that. 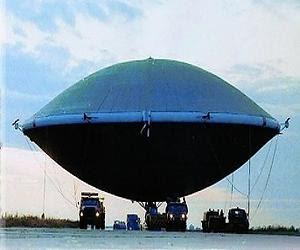 The government of the Ulianovsk Region in the Volga area has approved a five-year program to produce so-called "flying saucers" - a bizarre hybrid of a helicopter and an aerostat. The first such aircraft, officially named "aerostatic thermoballasted vehicle" or simply "Locomoskayner" after its manufacturer LocomoSky, was presented MAKS-2009 air show. The prototype flying saucer was seven meters (23 feet) in diameter and was able to transport 20 kg (44.4 lbs) of cargo. The company, however, plans to produce aircraft with a cargo-carrying capacity of up to 600 metric tons or a passenger capacity of up to 11,000 people. It will be able to hover, perform a vertical landing, move in a straight line with speeds close to 100 kmph, turn around and will need no special ground-based facilities to land. The flying saucer will have low fuel consumption as compared to ordinary aircraft due to its aerodynamic form and will be able to transport outsized cargoes to remote and inaccessible areas. According to the regional government's estimates, the project will attract over $90 billion in investments. It will also create about 800 jobs in the region and bring some $4 million to the budget in tax payments. LocomoSky has already started to build a production facility site in an industrial zone in the area.